The Peoples Democratic Party (PDP) scored zero vote in both the governorship and house of assembly elections at Godswill Akpabio’s polling unit, Unit 9, Ukana West Ward 2, Essien Udim Local Government Area, Akwa Ibom State. Mr Akpabio, a former governor of the state, is the senator representing Akwa Ibom North-West District. His party, the All Progressives Congress (APC), scored 1597 in the governorship election in the unit. It scored 1596 in the house of assembly election. Mr Akpabio had failed to win re-election for a second term during the national assembly election. His opponent, Chris Ekpenyong of the PDP, was declared the winner of the election. The senator, who claimed he was the winner of the election, accused the Independent National Electoral Commission (INEC) of tampering with his election result. He is challenging the result at the election tribunal. Mr Akpabio had boasted recently that the APC would defeat the PDP in the Akwa Ibom governorship and house of assembly elections. “I will tell you something. Those who are jubilating now will be so shocked that on the ninth of March that state would go 80 per cent APC. That is the truth,” he said in an interview aired on Channels TV. It is, however, too early to say if the APC is winning in the senator’s Essien Udim Local Government Area and in the entire state. 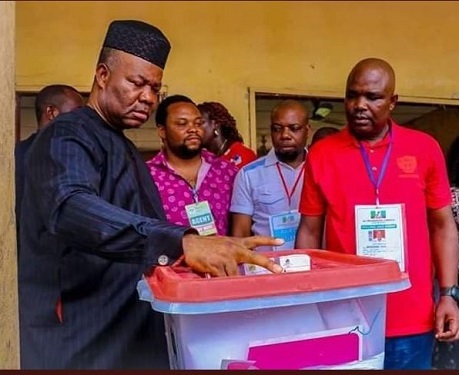 The post PDP Scores Zero Vote In Senator Akpabio’s Polling Unit appeared first on Naijaloaded | Nigeria’s Most Visited Music & Entertainment Website.